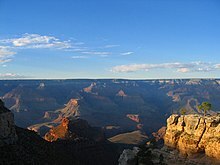 Grand Canyon National Park, south rim of canyon - Although biodiversity loss continues globally, many countries are significantly slowing the rate of loss by shoring up protected natural areas and the services they provide, and in expanding national park systems with tighter management and more secure funding. -Helen Clark. At Rio+20 we will continue to make the links between sustainable development and the biodiversity and ecosystem services which underpin it, focusing on the additional issues now being addressed, such as the health of oceans and food security -Helen Clark. The cutting of primeval forest and other disasters, fueled by the demands of growing human populations, are the overriding threat to biological diversity everywhere. - Edward O. Wilson. Biodiversity is the degree of variation of life This can refer to genetic variation, species variation, or ecosystem variation within an area, biome, or planet. Terrestrial biodiversity tends to be highest near the equator, which seems to be the result of the warm climate and high primary productivity. Marine biodiversity tends to be highest along coasts in the Western Pacific, where sea surface temperature is highest and in mid-latitudinal band in all oceans. Biodiversity generally tends to cluster in hotspots and has been increasing through time but will be likely to slow in the future. In Georgia, UNDP continues to support the development of democratic institutions. Georgia is part of the global biodiversity hotspot of the Caucasus Ecoregion, with a network of Protected Areas covering seven per cent of the country. Helen Clark in:"Helen Clark: UNDP's Pragmatic Visionary"
At Rio+20 we will continue to make the links between sustainable development and the biodiversity and ecosystem services which underpin it, focusing on the additional issues now being addressed, such as the health of oceans and food security. Biodiversity is defined as the natural variety and variability among living organisms, the ecological complexes among living organisms, the ecological complexes in which they naturally occur, and the ways in which they interact with each other and with the physical environment rooted in biological science. Biodiversity is defined as 'the variability among living organisms from all sources, including, inter alia, terrestrial, marine, and water aquatic ecosystems, and the ecological complexes of which they are part; this includes diversity within species, between species and of ecosystems. To many people, 'biodiversity' is almost synonymous with the word 'nature,' and 'nature' brings to mind steamy forests and the big creatures that dwell there. Fair enough. But biodiversity is much more than that, for it encompasses not only the diversity of species, but also the diversity within species... It is the diversity within species that keeps species going. This is the diversity upon which natural selection works, the diversity that fuels adaptation and evolution for everything from pandas to peas. Unless we appreciate the critical role that intra-species biodiversity plays in the survival of species, we risk seeing extinction as a numbers game, as something that happens when the last individual dies. Whether we consciously realize it or not, the biodiversity with which we are most familiar, and the biodiversity with which we have most intimate historical, cultural and biological connections, is that associated with food plants.We all know that apples come in red, yellow and green models, and we know some of the varietal names. But how many people realize that there are thousands of distinct varieties of potatoes, tens of thousands of varieties of beans, hundreds of thousands of types of wheat, and even more of rice? Biodiversity, the variety of life, is distributed heterogeneously across the Earth. Some areas teem with biological variation (for example, some moist tropical forests and coral reefs), others are virtually devoid of life (for example, some deserts and polar regions), and most fall somewhere in between. Determining why these differences occur has long been a core objective for ecologists and biogeographers. It constitutes a continuing, an important, and to many an enthralling, challenge. Spatial heterogeneity in species richness, in particular, is an obvious feature of the natural world. An understanding of its determinants will impinge on applied issues of major concern to humankind, including the role of biodiversity in ecosystem processes, the spread of alien invasive species, the control of diseases and their vectors, and the likely effects of global environmental change on the maintenance of biodiversity. Kevin J. Gaston in: "Global patterns in biodiversity"
There are more effective ways of tackling environmental problems including global warming, proliferation of plastics, urban sprawl, and the loss of biodiversity than by treaties, top-down regulations, and other approaches offered by big governments and their dependents. These “more effective ways” focus on harnessing a multitude of local and small-scale initiatives to the task – the “little platoons” of civil society. ...the negative impacts of our flawed designs-from global warming and water pollution to the loss of biodiversity and natural resources-designers have a critical role to play in the creation of a more just, healthful and sustainable world. - William McDonough. Simply put, design matters. And at a moment in our history in which the scientific community has issued serious warnings about the negative impacts of our flawed designs-from global warming and water pollution to the loss of biodiversity and natural resources-designers have a critical role to play in the creation of a more just, healthful and sustainable world. In the context of conservation science the term ‘biodiversity’, a contraction of ‘biological diversity’, is relatively young. ‘Biological diversity’ in its current sense began to be used in the early 1980s, with interest in the concept elevated by publications such as ‘Limits to Growth'. land degradation - We see evidence that lakes and forests and wetlands can have different equilibria - so you have a savanna system that may be stable and thriving, but it can also tip over and become an arid steppe if pushed too far by warming, land degradation, and biodiversity loss. - Johan Rockstrom. Scientists themselves readily admit that they do not fully understand the consequences of our many-faceted assault upon the interwoven fabric of atmosphere, water, land and life in all its biological diversity. Things could turn out to be worse than the current scientific best guess. In military affairs, policy has long been based on the dictum that we should be prepared for the worst case. Why should it be so different when the security is that of the planet and our long-term future? The cutting of primeval forest and other disasters, fueled by the demands of growing human populations, are the overriding threat to biological diversity everywhere. We should preserve every scrap of biodiversity as priceless while we learn to use it and come to understand what it means to humanity. We should not knowingly allow any species or race to go extinct. The variety of life at every hierarchical level and spatial scale of biological organisations are: genes within populations, populations within species, species within communities, communities within landscapes, landscapes within biomes, and biomes within the biosphere.